Tom and Barbara would have been proud of ‘Margo’ aka Penelope Keith who has turned to the ‘Good Life’ to own her own flock of chickens. Penelope was in Mid Sussex yesterday (Thursday) when she opened the 2013 South of England Show at Ardingly. During a brief speech she extolled the virtues of chickens and urged everyone to own them, and if they were not able to, to buy free range, British eggs. Tom and Barbara Good, played by the late Richard Briers and Felicity Kendal, turned their suburban garden into a smallholding where they grew all their own food and kept chickens and pigs, much to the simmering disquiet of posh neighbour, Margo, and her husband, Jerry. Penelope is the 2012/13 president of the South of England Agricultural Society and opened this year’s premier agricultural show on the first of its three days. This entry was posted in Chickens, News and tagged Ardingly, chickens, Felicity Kendal, Good Life, Mid Sussex, Penelope Keith, Richard Briers, Television on June 11, 2013 by naturalpfg. I saw this an had to post it. Jimmy Fallon heads this great cast as four chickens do an all-clucking version of Fun‘s “Some Nights,” featuring Amy Poehler and Michael Buble. This entry was posted in Chickens, Humour and tagged Amy Poehler, Blake Shelton, Chicken song, chickens, fun, funny, humour, Jimmy Fallon, Late Night with Jimmy Fallon, Michael Buble, Nick Offerman, Tribute act on June 5, 2013 by naturalpfg. 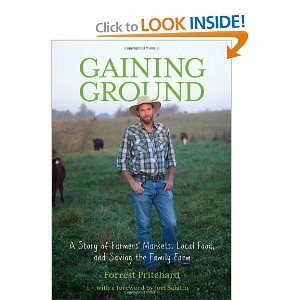 This is a great blog by Wendy Thomas about the ethical chicken farmer Forrest Pritchard and his new book Gaining Ground. Hey folks, there’s a new farming/organic living book out that is generating a lot of buzz. Written by Forrest Pritchard (and with a foreword by Joel Salatin) Gaining Ground is the true story of how a young man chose to take on the task of literally saving the family farm by turning it into an ethical and profitable way to make a living. It’s a great story filled with ups and downs, humor and life lessons. In short, it’s the kind of book that makes you feel good after reading it. That’s the kind of story that I love most to read. This entry was posted in Chickens, Feeding, Free range, Health, Housing and tagged chicken, chickens, feeding, Forrest Pritchard, Health, housing, Joel Salatin, welfare on May 31, 2013 by naturalpfg. And now a little something to put a smile on your face! This entry was posted in Chickens, Humour and tagged chickens, funny, gonzo, humour on April 22, 2013 by naturalpfg. Cage free, free range and pastured – what does it really mean? You think you know what ‘cage free’ is right? Probably even the term, ‘free range‘? But do you know what they really mean and why a new term, ‘pastured’ is coming into prominence? This brilliant little film from PBS will reveal all. Can learning the meaning of a single term actually help change the food system? David Evans and Alexis Koefoed think so. These poultry farmers explain the real story behind such terms as “cage free, “free range” and “pasture raised” so that consumers can make informed decisions when they go to their local supermarket. A third generation farmer in West Marin, David raises pastured poultry and grassfed beef for customers across the entire San Francisco Bay Area. And what is the THE LEXICON OF SUSTAINABILITY™? It’s a multiplatform project based on a simple premise: people can’t be expected to live more sustainable lives if they don’t know the most basic terms and principles that define sustainability. Filmmaker/photographer Douglas Gayeton and producer Laura Howard-Gayeton have crisscrossed the United States to learn this new language of sustainability from its foremost practitioners. Their unusual “crowd-sourcing” approach allows the public to suggest ideas and even host shows of the work. These methods have helped transform their grassroots project into an international organization with volunteers across the globe. This entry was posted in Chickens, Free range and tagged cage free, chickens, Free range, Free-range eggs, pastured on March 27, 2013 by naturalpfg.